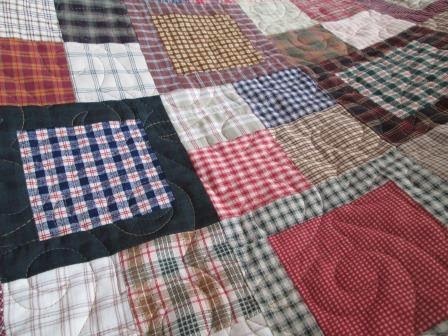 This plaid quilt was done by my mom. I did the machine quilting for her. After she got the quilt top done she was asking me if we had done one of these together before. Yes we did. About 3 or 4 years ago we did the same pattern. I believe the pattern was from a quilt book called It's A Dog' Life. So pretty in plaids! That would be a great 'boy' quilt. Oh I really like how that works with the plaids. 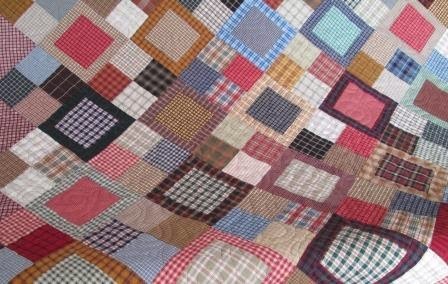 I'm especially fond of plaid quilts - your mom's is great! I'll be saving this pattern in my Plaid Inspiration file! Great quilt with all the plaids. I have saved some old shirts ……..